Just diagnose a dog or cat with lymphoma or mast cell tumor and not sure what to do??? Join us for a FREE VETgirl online veterinary continuing education webinar thanks to a sponsorship from Zoetis! In this interactive, 1-hour lecture, Dr. Philip Bergman, DACVIM (Oncology) will review recent updates and advances in the field of veterinary oncology. How should we be managing the common side effects of cancer and chemotherapeutics? Should an antiemetic be a standard part of treatment plans? When should tyrosine kinase inhibitors be used in mast cell tumor patients when indicated? Should I be doing lymph node aspirates in my workups for patients with cancer? Are there any new pharmacogenetic tests available that I should be doing? Learn it in this free VETgirl online veterinary CE webinar! Thanks to sponsorship from Zoetis, this was delivered LIVE, FREE to ALL! 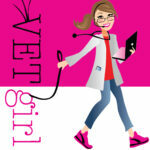 All VETgirl webinars are recorded and placed in our VETgirl library. Our ELITE members have accesss to all content 24/7/365! But want to watch this webinar and receive CE Credit?